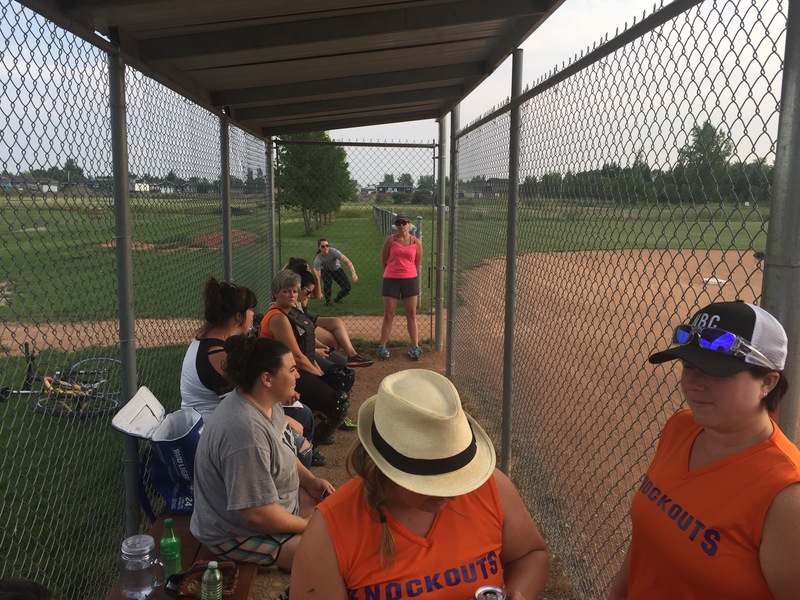 Monday evenings in the summer are spent at the ball diamond – and these Monday nights are for the ladies. That’s right – ladies beer ball league invades town – and it is on this day of the week where you get to witness The Misfits, Dream Team, Lady Lightning, but most importantly The Knockouts play some stellar slow-pitch (We also have two teams from neighbouring towns – but we just call them the town names – sorry Deloraine and Killarney). I’ve been playing for a few years now (5 I think) and I must say that it is definitely a highlight of my week! We might not be the best team out there – but we have a ton of fun and laugh a lot! We are quite the eclectic group – we come from all walks of life and a myriad of professions (just to highlight – we have a lawyer on our team FYI, a hair stylist, and a couple of teachers just to name a few). I believe we have the largest age range – from young-ish to “old” (but let’s be honest age is just a number – and our hair stylist makes sure we don’t look too old) We have those who show up in full gear and cleats and those who still kick at the ball (we’re converting a soccer player), or jump out of the way of the ball (#notnamingnames #youknowwhoyouare 😂), some have played competitively in their glory days and some are learning and playing the game for the first time ever! We have our fair share of pirouettes, pretzels, and nose dives BUT we do have one player (yes just one) who will voluntarily slide into bases! The rest of us fall and trip over the base and call it a slide. We groan and complain that we are all getting old and chances are we have all pulled at least one (if not multiple) muscles throughout the season – and if you are lucky enough to make it through the season without injury – you will (I promise) be injured in some capacity during The Tournament. There WAS a triple play in the tournament! I believe it was.. the stylist!! !